Hexham is full of history and who would be interested in that? Right in the hub of the medieval streets, Hexham Abbey is open for visitors to learn about the church which was founded in 674 AD and even look around the Saxon crypt which has been left largely untouched for 1300 years. If the past did happen to be something you were interested in, you might also like to peer in the dungeon of Hexham Old Gaol, England’s first purpose-built prison in the 14th Century, learn about the raids of the Border Reivers in the interactive museum and even try out the stocks if you dare. Hexham has many art galleries displaying beautiful pieces throughout the town. As well as the many independent galleries and studios selling paintings, there are even places specialising in glasswork and pottery where you can even bring out your own inner artist. Who would want to look around an impressive variety of shops offering a range of unique products? 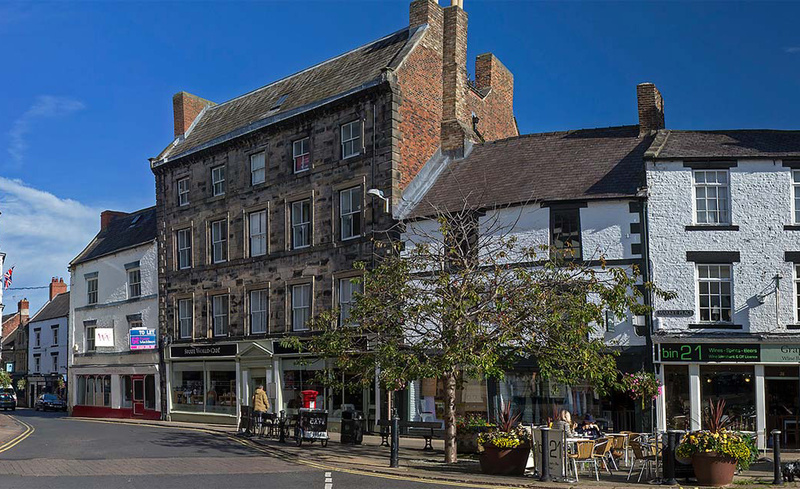 Hexham is home to a whole array of independent businesses, providing everything from jewellery to stationary and textiles to pottery. Shop instruments at Allegretto Music, find your next page turner at Cogito Books, something loved from the past at The Vintage Emporium and many more. The stunning views of the surrounding countryside are likely to win over the most ardent city dweller.The unspoiled landscapes of Northumberland National Park and Walltown Country Park are just a short drive from Hexham and in addition to immersing yourself in nature;there is also access to some of the best sections of Hadrian’s Wall. Hexham is home to a vast number of restaurants, serving English comfort food as well as cuisine from Poland, India and the Mediterranean. As if that wasn’t enough to stop you visiting, the town also has a whole host of coffee shops, artisan bakeries and even an ice cream parlour. And let’s not get started on the number of pubs! As if the impressive Abbey and Old Gaol weren’t enough, the town isn’t far from a number of Roman ruins and museums. The surrounding area is home to Housesteads Roman Fort, Chesters Roman Fort and Museum, the Roman Army Museum and Vindolanda, which is one of Europe’s most important Roman archaeological sites with live excavations taking place every year. And who would want to see all that? Hexham has a thriving cultural scene right in the town centre. A packed programme at Queen’s Hall Arts Theatre boasts music, drama, dance, exhibitions, film and comedy and the Forum Cinema regularly screens live satellite transmissions from the National Theatre, the Bolshoi Theatre and the Royal Opera House as well as having live music and art exhibitions in their café space. With historic sites, buildings and even a choice of parks barely out of the town centre, how will you fit it all in? Right on the banks of the river, The Tyne Green Country Park is home to an abundance of plants and wildlife and a beautiful 18th Century bridge. Also not to miss on your visit are the historic formal gardens of Hexham House, the bandstand in the grounds of the Abbey and the fantastic views from the open hillside of the Sele. 9. Who needs this many markets? If the vast amount of choice in Hexham’s shops to peruse wasn’t enough we’re spoilt for choice by having three markets selling a whole range of goods. Situated between the Abbey and the Old Gaol’s Moot Hall, the Market Place hosts a market every Tuesday and Saturday, you can browse Shambles Market every Tuesday and pick up fresh produce from the popular Hexham Farmers Market on the second and fourth Saturdays of every month. The number one reason not to visit Hexham is that once you’ve visited the area, you will never want to leave. From the Old Gaol to the Roman Forts and the vast array of shops and restaurants, you will never be stuck for how to spend your time in the town. With so many attractions you will be spoilt for choice from start to finish and before you’ve even left Hexham you will already be planning your next visit back.